Background: Adiponectin has been proposed as a biomarker of disease severity and progression in chronic obstructive pulmonary disease (COPD) and associated with spirometry-defined COPD and with computed tomography (CT)-measured emphysema. Increased adiponectin plays a role in other diseases including diabetes/metabolic syndrome, cardiovascular disease and osteoporosis. Previous studies of adiponectin and COPD have not assessed the relationship of adiponectin to airway disease in smokers and have not evaluated the effect of other comorbid diseases on the relationship of adiponectin and lung disease. We postulated that adiponectin levels would associate with both airway disease and emphysema in smokers with and without COPD, and further postulated that body composition and the comorbid diseases of osteoporosis, cardiovascular disease and diabetes might influence adiponectin levels. Methods: Current and former smokers from the COPD Genetic Epidemiology study (COPDGene) (n= 424) were assigned to 4 groups based on CT lung characteristics and volumetric Bone Density (vBMD). Emphysema (% low attenuation area at -950) and airway disease (Wall area %) were used to assess smoking-related lung disease (SRLD). Group 1) Normal Lung with Normal vBMD; Group 2) Normal Lung and Osteoporosis; Group 3) SRLD with Normal vBMD; Group 4) SRLD with Osteoporosis. Cardiovascular disease (CVD), diabetes, C-reactive protein (CRP) and T-cadherin (soluble receptor for adiponectin) levels were defined for each group. Body composition was derived from chest CT. Multivariable regression assessed effects of emphysema, wall area %, bone density, comorbid diseases and other key factors on log adiponectin. Results: Group 4, SRLD with Osteoporosis, had significantly higher adiponectin levels compared to other groups and the effect persisted in adjusted models. Systemic inflammation (by CRP) was associated with SRLD in Groups 3 and 4 but not with osteoporosis alone. In regression models, lower bone density and worse emphysema were associated with higher adiponectin. Airway disease was associated with higher adiponectin levels when T-cadherin was added to the model. Male gender, greater muscle and fat were associated with lower adiponectin. Conclusions: Adiponectin is increased with both airway disease and emphysema in smokers. Bone density, and fat and muscle composition are all significant factors predicting adiponectin that should be considered when it is used as a biomarker of COPD. Increased adiponectin from chronic inflammation may play a role in the progression of bone loss in COPD and other lung diseases. Funding Support: The project described was supported by Award Number R01HL089897 and Award Number R01HL089856 from the National Heart, Lung, and Blood Institute. It was also supported by 1R01HL122464. The content is solely the responsibility of the authors and does not necessarily represent the official views of the National Heart, Lung, and Blood Institute or the National Institutes of Health. The COPDGene® project is also supported by the COPD Foundation through contributions made to an Industry Advisory Board comprised of AstraZeneca, Boehringer Ingelheim, Novartis, Pfizer, Siemens, Sunovion, and GlaxoSmithKline. Biomarkers like adiponectin should relate to specific biologic events –airway inflammation and emphysema, more closely than to reduced spirometry values. In addition, smokers with normal spirometry who don’t meet criteria for COPD may still have both emphysema and airway disease with impacts on the biomarker, and smokers who meet spirometric criteria for COPD may have varying amounts of emphysema and airway disease. Biomarker associations may be confounded by the occult presence of comorbid diseases and COPD may present with a variety of comorbid conditions including cachexia, osteoporosis, cardiovascular disease and cancer.13-15 Increased adiponectin is also associated with Type 1 diabetes and cardiovascular disease16 while Type 2 diabetes and metabolic syndrome are associated with lower adiponectin. Most studies of adiponectin in COPD have not quantified the comorbid conditions that may also affect adiponectin levels. Based on those considerations, we hypothesized that the CT characteristics of smoking-related disease (emphysema, airway wall thickening, reduced bone density and body composition measures of fat and muscle) would all influence adiponectin levels. 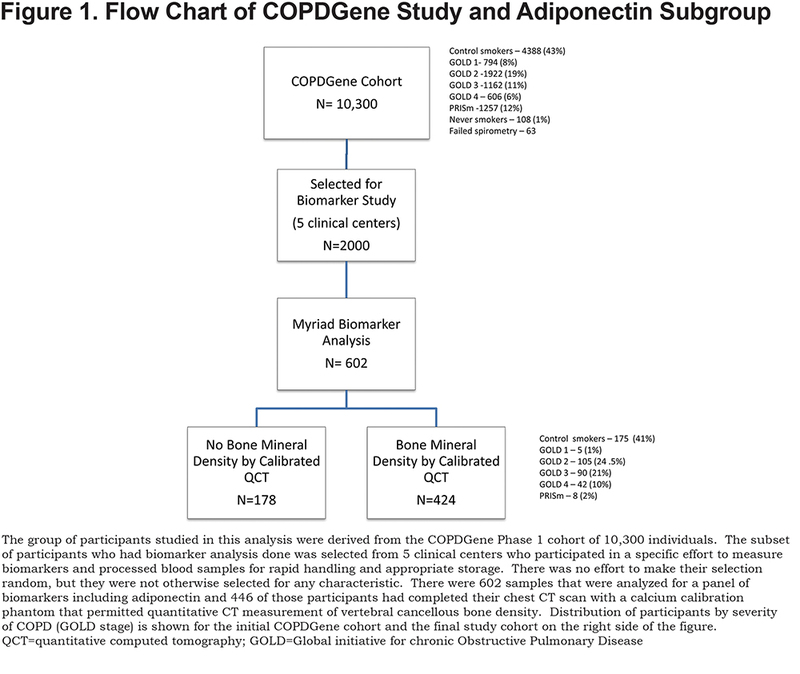 Using a subset of patients from the COPD Genetic Epidemiology (COPDGene) biomarkers study we assigned each individual to 1 of 4 groups based on airway disease (wall area percentage), emphysema and bone density. Participants were 424 non-Hispanic white, current and former smokers with a minimum of 10 pack years smoking who were part of an ancillary biomarker study within the COPD Gene Study.26 These individuals were selected from the earlier biomarker study group reported by Carolan et al2 because they also had bone density information available. The relationship of these groups to the main COPDGene study is shown in Figure 1. The major demographic difference between the biomarker group and the main cohort was that it did not contain African American individuals. The biomarkers group also had significantly fewer current smokers than the main cohort. All participants signed informed consent documents and institutional review board approval was obtained at each clinical center. This was a case control study with a control group and 3 case comparisons. Group 1 was the normal reference control group with no CT airway disease, emphysema or osteoporosis (Normal Lung—Normal Bone). Group 2 had no CT airway disease or emphysema but had osteoporosis (Normal Lung—Osteoporosis). Group 3 had either CT airway disease or emphysema (smoking-related lung disease [SRLD])—Normal Bone. Group 4 had either CT airway disease or emphysema (SRLD with Osteoporosis). We further included measures of C-reactive protein (CRP) as a marker of systemic inflammation and T-cadherin as a lung transporter protein for adiponectin in our analysis to define potential pathways and as covariates in models relating adiponectin to lung disease and osteoporosis. Computed tomography (CT) scans were acquired using multi-detector CT scanners and standardized protocols and quantitative lung analysis as described previously using SLICER software (3D-Slicer, Brigham and Women’s Hospital, Boston, Massachusetts) and VIDA analysis (VIDA Diagnostics, Inc., Coralville, Iowa).28 Criteria for airway disease was wall area percentage (WA%) at the segmental level of > (61.2). This value was selected because it was above the 90th percentile for wall area percentage in the COPDGene never-smoker group. Criteria for a participant having abnormal emphysema was: low attenuation area at -950 Hounsfield units > 6.7 (75th percentile for never smoker normal). INTableTM CT (Image Analysis Inc., Columbia, Kentucky) scanner pads containing calcium hydroxyapatite (CaHA) calibration rods were included in the scan field of view to provide calibrated bone density. Volumetric bone mineral density (vBMD) over a minimum of 3 vertebral bodies to calculate a mean was measured with automated software, N-VivoTM (image analysis, QSR International, Melbourne, Australia) that calibrated voxel density to the CaHA rods. Criteria for classifying the extent of bone loss were derived using young adult, gender-specific qualitative computed tomography (QCT) reference data from Budoff et al measured with the same software and calibration phantom.29 Osteoporosis or low bone density was defined as T-scoreQCT < -2.5 or less using the conventional 2.5 standard deviations below the young adult population mean. Intermediate bone loss was defined as a T-score by QCT between -1 and -2.5 and normal bone density was T-score by QCT > -1.0. We tested the association of the groups to adiponectin levels with and without adjustment for age, gender, BMI and smoking status using multiple regression analysis. Natural log-transformed adiponectin was regressed due to non-normality on residuals. Least squares (LS) means of log adiponectin were estimated in a generalized linear model, after adjusting for age, gender, BMI, and smoking status. For the post hoc test of log adiponectin among the groups, we used the Tukey’s method for multiple comparison adjustment. We looked at factors associated with log adiponectin levels in 2 regression models (A and B). The models included age, gender, BMI, current smoking status, pack years, WA%, emphysema, T-score for BMD, lean pectoralis muscle area, subcutaneous fat area and a history of diabetes or CAD. Model A was the basic model without T-cadherin and Model B included it. All statistical analyses were performed using SAS (version 9.3, SAS Institute, Cary, North Carolina). Power calculations were done for the 4-group analysis of variance (ANOVA) and for the regression models using PASS (NCSS LLC, Kaysville, Utah). Key demographic and clinical characteristics of the study participants by group are presented in Table 1. 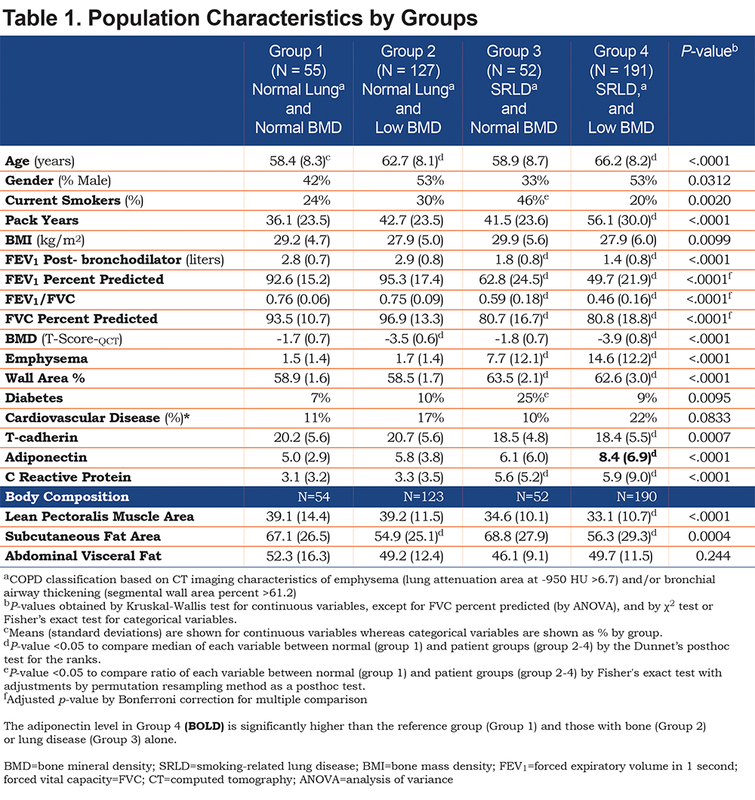 Group 1, Normal Lung—Normal Bone was younger, had fewer pack-years smoking exposure, higher forced expiratory volume in 1 second (FEV1), and the lowest adiponectin levels. The mean pectoralis muscle area for this group was higher, as was subcutaneous fat area. There were significant differences in gender and smoking status among the groups (p-value < 0.05). Groups 3 and 4, comprising individuals with SRLD, had significantly worse spirometry values consistent with COPD. Subcutaneous fat was significantly lower in both of the osteoporosis groups (Groups 2 and 4). Muscle area was significantly lower in Group 4 with lung and bone disease. BMD, emphysema and WA% values confirmed the group assignments. CRP was increased significantly in the 2 groups with SRLD (p<0.001), but not in groups 1 and 2 with no lung disease. Self-reported cardiovascular disease was increased in Group 4 but did not reach statistical significance (p=0.08) while diabetes was significantly higher in Group 3. We found a significant association of Group 4 with increased adiponectin after adjusting for age, gender, BMI, and smoking status (p<0.0001). In Figure 2, we illustrate the adjusted means of log adiponectin by group and gender using a generalized linear model, after adjusting for age, BMI, and smoking status. Adjusted means of log adiponectin levels by group tended to be higher in females than those in males so we illustrate a stratified analysis. No significant differences were identified between other groups and power analysis showed 91% power to detect differences in our model for log adiponectin. 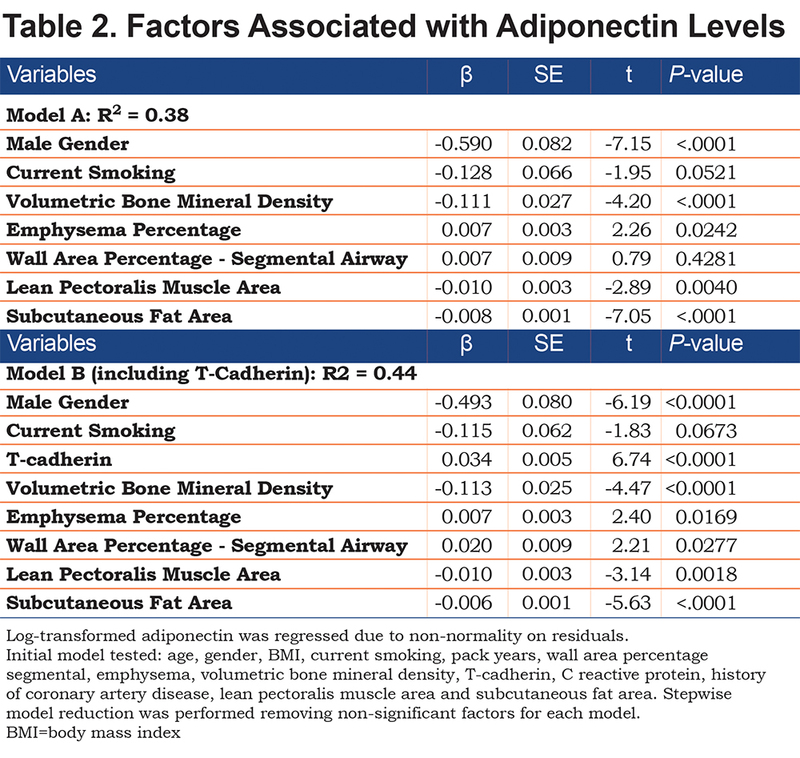 An overall regression model for the whole sample (Table 2, Model A) looked at associations of body composition, WA%, emphysema and bone density to adiponectin. The model showed that male gender, greater muscle area and subcutaneous fat were associated with lower adiponectin levels. Worse emphysema, and lower bone density were associated with higher adiponectin but WA% was not significant in this model that did not include T-cadherin. Age, BMI, pack-years smoking, CRP and history of CAD were not significant factors predicting adiponectin levels. A second model (Table 2. Model B) adding T-cadherin showed a higher R2 value for the model, suggesting improved model fit, and wall area percentage became significant (p=0.028). We found that increased adiponectin levels were associated with the combination of SRLD (based on CT-measured emphysema and airway wall thickening) and osteoporosis in a cohort of smokers, but not with either condition alone. Neither diabetes nor cardiovascular disease was significantly associated with adiponectin in our cohort after adjustment for other variables. Previous studies have focused on associations of adiponectin to either COPD or osteoporosis but have not evaluated the relationship in individuals presenting with both diseases. A history of previous smoking is common in patients over age 45 and COPD may not have been reliably identified or sought in studies of osteoporosis. 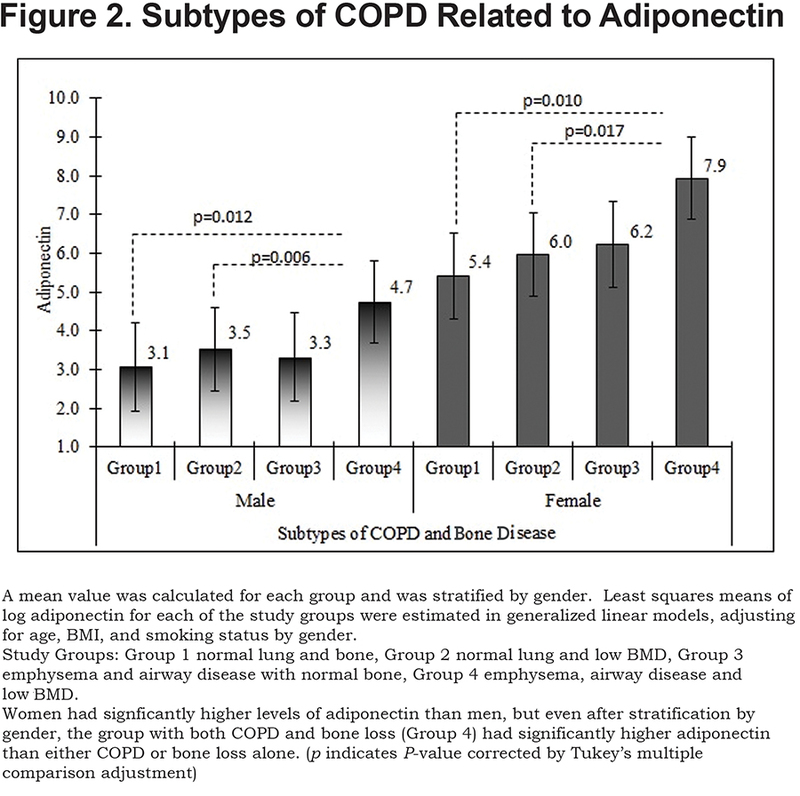 Likewise, COPD association studies have not quantified bone density in relation to adiponectin and lung disease. Because COPD is a heterogeneous disease that can involve emphysema and/or airway disease and is diagnosed based on spirometry, not CT, we chose to study the relationship of adiponectin to the measured variables of quantitative emphysema and airway wall thickening as characteristics of SRLD. This allowed us to look separately at these factors and encompass smokers with and without COPD by spirometry. In our cohort, participants with significant osteoporosis but without lung disease, and those with significant lung disease without osteoporosis did not have increased levels of adiponectin. This suggests that osteoporosis or COPD alone are not associated with elevated adiponectin levels and each may require an additional process to drive up adiponectin levels. Our findings of elevated adiponectin levels among patients presenting with emphysema, airway disease and osteoporosis are consistent with the underlying biology. Adiponectin receptors are present in the lung, and adiponectin is increased in bronchoalveolar lavage fluid and lung airway epithelial cells of COPD patients.5 Lung concentrations of adiponectin are related to T-cadherin transport in normal lung or diffusion from blood in inflammatory lung disease.6,32 Airway disease as quantified by WA% is a significant factor predicting adiponectin levels beyond emphysema in smokers when T-cadherin is included as a factor. In a study of the impact of adiponectin on revascularization, the authors found a similar need for T-cadherin to mediate the effect of adiponectin.33 Airway disease and emphysema have distinct and additive effects on adiponectin levels. We find, as others have, that osteoporosis is associated with higher adiponectin levels, but the impact of adiponectin on bone remodeling is complex and distinct from the relationship to lung or heart. Bone mass appears to decrease in response to increased adiponectin levels due to local signals in the bone marrow.18 Adipocytes and osteoblasts share a common mesenchymal progenitor cell in the bone marrow and the regulation of bone formation and fat storage are complexly inter-related. An overall summary of factors related to higher adiponectin is that disease states--more emphysema, thicker airways, lower bone density and reduced muscle mass-- are associated with higher adiponectin. COPD patients are at high risk for both osteoporosis35,36 and cardiovascular disease.37 We did not find that self-reporting of CAD was a significant factor predicting adiponectin levels in adjusted models in this study, although a larger proportion of participants reported CAD in Group 4 and more reported diabetes in Group 3. CRP as a marker of systemic inflammation was higher in the 2 groups with COPD, however in adjusted models it was not a significant predictor of adiponectin. Our study had several limitations. It was not population based and the COPDGene study enhanced recruitment of COPD participants in order to study the disease effectively. Only non-Hispanic white participants were included. Osteoporosis is much less common in African Americans and our findings will need to be evaluated in other racial/ethnic populations. Our ascertainment of comorbid diseases was based on self-reporting of physician diagnoses and medication use. Use of WA% as a marker of airway disease has not been widely tested against symptoms or disease progression although it reflects an anatomic difference in the airways. It is not part of the Global initiative for chronic Obstructive Lung Disease38 criteria for COPD. Analysis of bone density was done using calibrated quantitative QCT measures rather than duel-energy x-ray absorptiometry. Other authors have looked at adiponectin in COPD. Yoon et al looked at patients from the Lung Health Study finding that adiponectin predicted decline in FEV1 and had a mixed relationship to mortality but did not associate with baseline FEV1,39 however they did not assess body composition or bone density. Suzuki compared decline in FEV1 to increased adiponectin and lower leptin/adiponectin ratio in 2 cohorts of COPD patients finding that higher adiponectin and lower ratio were associated with worse outcomes,11 but did not report body composition. Their discovery cohort had less than 10% women and their validation cohort was more balanced but given the significant differences between men and women in adiponectin levels, this may have impacted the generalizability of their results. The study that preceded this analysis from the COPDGene biomarkers cohort by Carolan et al found associations of higher adiponectin to female gender, low BMI, older age, lower FEV1 and emphysema.2 They found an inverse relationship to 2 different airway disease measures (Pi10 and Pi15) but did not have bone density, fat or muscle available for analysis. With this additional body composition data, we can refine the analysis and demonstrate the association of airway disease to adiponectin. Smoking-related lung disease and osteoporosis together are associated with increased adiponectin. T-cadherin, a soluble receptor for adiponectin appears to be a key factor in airway disease that is associated with higher adiponectin levels. Either lung disease or osteoporosis assessed separately without consideration of the other, may lead to erroneous results when using adiponectin as a biomarker of disease. Due to the coexistence of multiple comorbid conditions in the complex diseases of aging, it is important to identify the impact of comorbid conditions on a biomarker and integrate those factors into association studies. The authors acknowledge the valuable contributions of the COPDGene investigators in developing the cohort and collection of data. Author Contributions: YJS and EAR contributed to data analysis. RPB contributed to compilation of the biomarker data. DAL, EAR and GRW CT worked on the imaging analysis. YJS, MLM, GRW, BJC, RPB, DAL, GLK, JMB, MHC, JDC, and EAR contributed to the study design, interpretation of data and manuscript preparation. EAR and YJS take overall responsibility for the manuscript. RPB is on the Advisory Board for Boehringer Ingleheim and has received a research grant from MedImmune/Astrazeneca. GRW reports consultancies for Merck, GlaxoSmithKline and Genentech. DAL has received research support from Siemens and reports consultancies for Parexel, Boehringer Ingelheim, Genentech, Gilead Inc, Veracyte Inc, and MEDQIA, Inc.
9. Chan KH, Yeung SC, Yao TJ, et al. Elevated plasma adiponectin levels in patients with chronic obstructive pulmonary disease.I nt J Tuberc Lung Dis. 2010;14:1193-1200. 13. Minino AM, Xu J, Kochanek K. Deaths: preliminary Data for 2008. Nat Vital Stat Rep. 2010;59(2):1-52. 38. Global Initiative for Chronic Obstructive Lung Disease (GOLD). Global strategy for the diagnosis, management and prevention of COPD, 2017. GOLD website. http://goldcopd.org/gold-2017-global-strategy-diagnosis-management-prevention-copd/ Published 2017. Accessed March 2018.